Are you planning to celebrate Christmas in Budapest this year? some interesting Hungarian Christmas traditions. followed by 25. and 26. December (Christmas Day & Boxing Day). in Városháza Park (till 27. 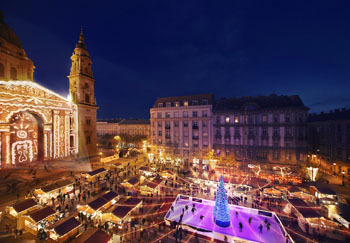 Dec 2019): a Winter Festival with a range of free family programs, children activities, a giant Advent Wreath, charity events, Budapest’s tallest Christmas tree and a handicrafts fair. Streets are decorated with colourful lights, shop-windows are adorned to lure in customers hunting for gifts. The Christmas city lights officialy light up on the first Sunday of the Advent period: at 17.00, 03. December. István Tarlós mayor will light the first candle on the wreath at the Winter festival in Városháza Park. More and more people set out to look for the ideal presents in shops, and the markets. Besides shopping, the city also offers plenty of programs, concerts, special holiday tours to treat visitors to a memorable experience. You can enjoy the wonderful view of the city swimming in lights. After dinner you can also admire the panorama and take photos from the open upper deck of the ship. Night cruise between 21.00 – 23.00 on 24th December. Price: 60 EUR/prs (53 EUR for students). Find out what else you can do in Budapest on 24. December/Christmas Eve! Celebrate Christmas on a romantic river excursion with multicourse dinner and drinks. Price: 65 EUR, student price: 58 EUR. TIP: If you prefer to go on a daytime boat tour check out the Cruise with Lunch (14.00), the Cruise & Wine Tasting (14.00, 16.00, 19.00) and the Sunset Cruise with Cocktails (14.00, 16.00, 19.00) programs that are available every day all year round. The Danube Symphony Orchestra performs a festive concert on 27th and 30th December in the Danube Palace, a stately, historic building in downtown Pest, close to the riverbank. The program starts at 20.00 and is twice 40-45 minute long. ballet pieces by the artists of the Budapest Operetat Theatre. The whole city calms down for a couple of days. You can hear only the sound of festive concerts and Advent songs in Budapest’s churches. After the hectic shopping it’s relaxing to listen to melodies of organ works and contemplate about the meaning of Advent and Christmas. Many churches (St. Stephen’s Basilica, St Anne Church in Buda, Church of St. Michael in Váci Str., the Inner City St. Anne Church on Szervita Sqr.) 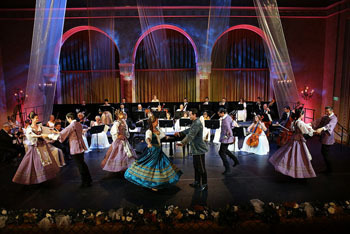 will host festive concerts over the weeks preceding Christmas and during the holiday. I recommend the Lights of Christmas Festival in one of the city’s most prestigious temple, the Matthias Church in Castle District. 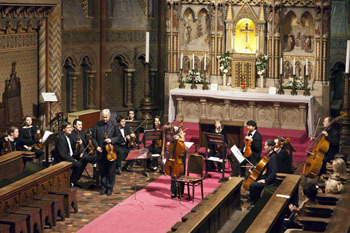 See More Festive Xmas/New Year Concerts in Budapest’s Concert Halls & Churches! TIP: Enjoy a spectacular Hungarian Folk performance, and catch a glimpse of the country’s rich folklore traditions and passion for music and dance. You can reserve the performance together with a night cruise starting at 22.00 at discount price. This way you not only have a great program for a full evening but you pay less! Here are some of the coolest Xmas programs taking place during the weeks preceding the holiday. 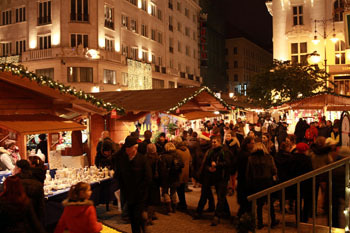 The Vörösmarty Square Christmas Fair has become one of the most popular of similar festive markets in Europe. Planned Date: 08. November 2019 – 01. January 2020. Folk craftsmen offer authentic handmade artifacts and souvenirs in homey wood pavilons surrounding the lofty Xmas fir and the giant Advent wreath. If you’re looking for unique one-of-a-kind presents you’ll definitely find something on the here. the Advent Festival & Fair on St. Stephen’s Square in front of the Basilica, between 22. Nov 2019. – 01. Jan 2020.
in Városháza Park in district V.
folk craft market offer entertainment for the whole family. A tall Christmas tree and the life-size Nativity Scene create a special pre-holiday atmosphere. The ice rink is open till 31. January from 8.00 to 20.00 every day. Entry is free. Renting of skates is available. Tickets: entry is free but visitors have to purchase a mug for 500 HUF to be able to sip mulled wine or hot tea and taste the culinary delicacies. All concerts, performances and the ice rink are free. Saturnalia – Aquincum Museum, 02. December 2019. An event that introduces visitors to the roots of Christmas in Antiquity. Saturn is the god of agriculture and time in Roman mythology. The ancient celebrations devoted to him were the predecessors of Christmas in Christian traditions. Where to Stay During Christmas? The city has ample hotels, apartments and hostels in all price categories. The Pest side of the Danube boasts a good number of high-end hotels. Most are part of large international hotel chains (Four Seasons, Sofitel, Marriott, InterContinental) – offering panoramic views of the Buda side and the river. 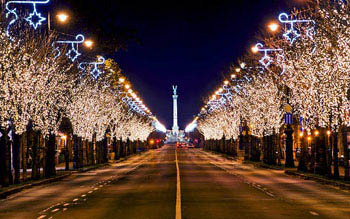 TIP: If you want to be close to the main festive market then stay at a hotel near Vörösmarty tér. The list includes most 5-star riverside hotels as well as less costly options located within walking distance of the square. Shops are open for the Bronze, Silver and Gold Sundays on the three weekends before Christmas. Shops close around early afternoon on 24th December and open only on 27th December. Some larger shopping malls might stay open until early evening on 24th December. On Christmas Day and Boxing Day all shops, supermarkets are closed. Many shops do not open between Christmas and New Year’s Eve. Life gets back to normal after 1st January. Restaurants are also closed on Christmas Eve (24th December), but some of them are open on 25th-26th December. Find out more about the Thermal Baths of Budapest. See also Opening Hours During Christmas in Budapest. Public transport vehicles run until around 15.00-16.00. After 16.00 night services carry passengers. On 25th – 26th December vehicles run according to holiday schedule. Between 27th and 1st January services run less frequently than they do on usual weekdays. It’s also holiday at schools so all public transport runs according to schedules valid on school holidays. TIP: You’ll find exact information on public transport schedules around the holidays on this page. 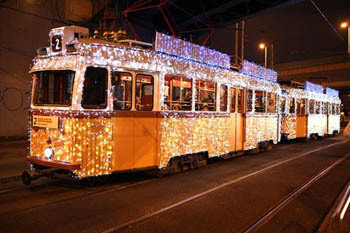 Budapest trams will turn into charming Christmas vehicles on 13 lines, twinkling with thousands of tiny LED lights. 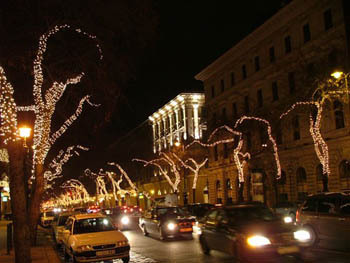 tram 47 (Városház tér/Buda – Deák Ferenc tér/Pest)) are dressed in decorative lights during the Holiday Season together with 11 other tram lines. The special holiday services operate between 01. December 2019. and 06. January 2020. (except for December 24. and 31.). Tram 4 will run on 01. January, the first vehicle departs at 17.00. See the departure times of the Christmas Trams here. View our photos of Christmas Tram 2. At Christmas we celebrate the birth of Jesus Christ in Hungary. The main celebration takes place on Christmas Eve (it’s Szenteste in Hungarian, meaning Holy Night). Family members get together in the afternoon on 24th December, and decorate the Christmas tree. Grandparents or elder brothers and sisters look after the little ones, so they won’t see their presents placed under the tree. The fragrant fir is adorned with colourful paper decorations and a special Hungarian Christmas candy (szaloncukor) wrapped in shinny coloured papers. Housewives cook traditional Hungarian Christmas dishes in the kitchen. We usually have fish soup, stuffed cabbage, pastry rolls stuffed with poppy seed, walnut or chestnut stuffing (it’s called bejgli in Hungarian). TIP: Try our Authentic Hungarian Christmas Recipes! Family members exchange gifts in the evening on 24th December while listening to traditional holiday songs. In Hungary baby Jesus brings the presents, not Santa. We celebrate the arrival of Santa on 6th December, St. Nicholas Day. At midnight people go to the midnight mass. Organ music and pine scent fill the air in churches where people sing together classical Christmas songs. Even non-religious people attend this mass because of its festive and uplifting atmosphere. On the following two days relatives and friends visit each other at their homes, have traditional main dishes, and desserts and enjoy each other’s company. When I was a little kid thick snow covered the streets by the end of December. The first snowflakes fell usually at the end of November. The temperatures were around zero or below. Today it is hard to tell what will be the weather like around the end-of-the-year holidays. Due to global warming we have not see any snow in the city in the past couple of years during the holiday. Some snow might fall in northern Hungary and in the hills. The weather around the holiday is sometimes rather mild and dull, with some rain, and it’s crispy and sunny with crystal blue sky at times. I prefer the latter, though I long for white Christmas every year. Find out more about Budapest Weather. The world famous 100-member Gypsy Orchestra performs a spectacular concert; they’ll play both classical and traditional folk music. Tickets are available with or without dinner and wine and/or snacks. See more programs in December in Budapest.